USS Lake Erie (CG 70), one the US Navy's newest Ticonderoga class guided missile cruisers, visited Vancouver in early 2001. Photographer Roy McBride provided this series of photos, forming an excellent detail study of the ship. Lake Erie was the last of 8 Ticonderoga class ships built by Bath Iron Works, delivered to the Navy 10 May 1993 and commissioned 24 July 1993. She is homeported at Pearl Harbor, Hawaii. A general starboard side view from ahead. 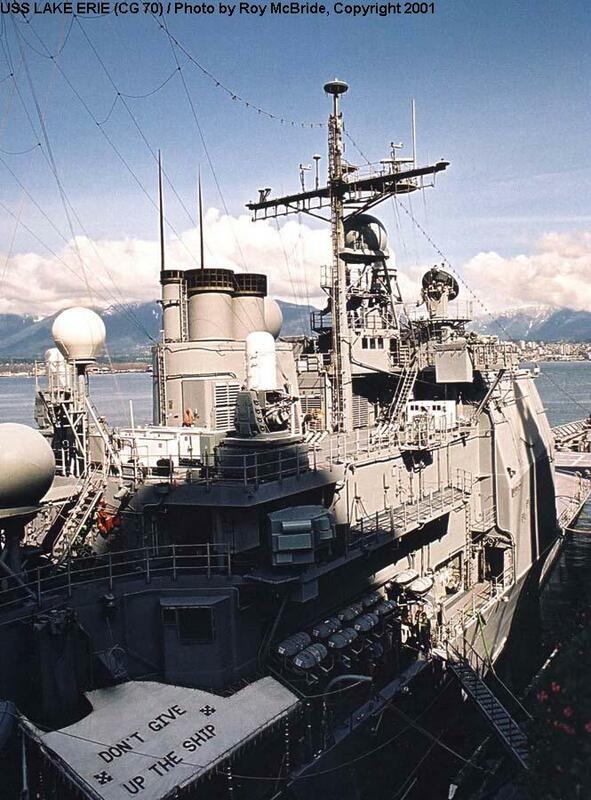 This view shows the bow bulkwarks added when these ships were adapted from the Spruance class design. 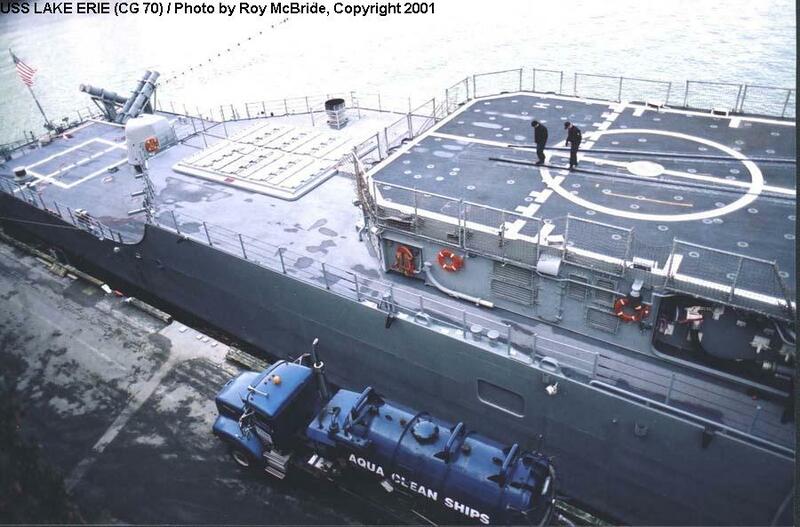 The forward superstructure carrys two SPY-1B radar arrays, one facing forward and one to starboard. 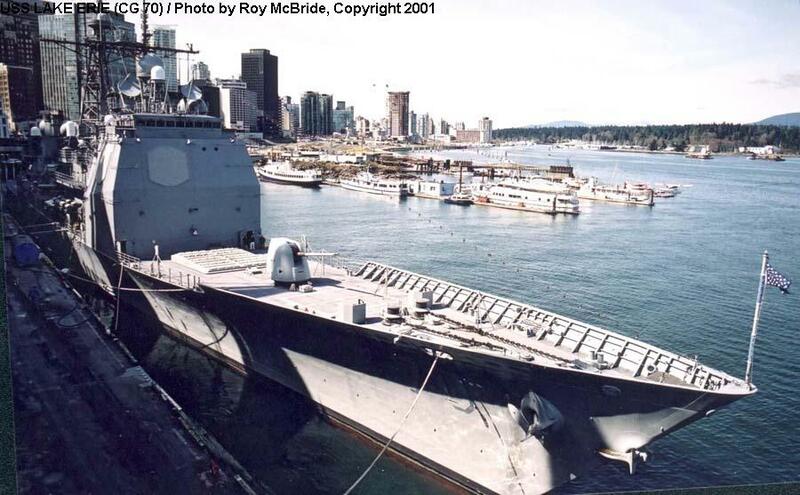 A second starboard bow view. 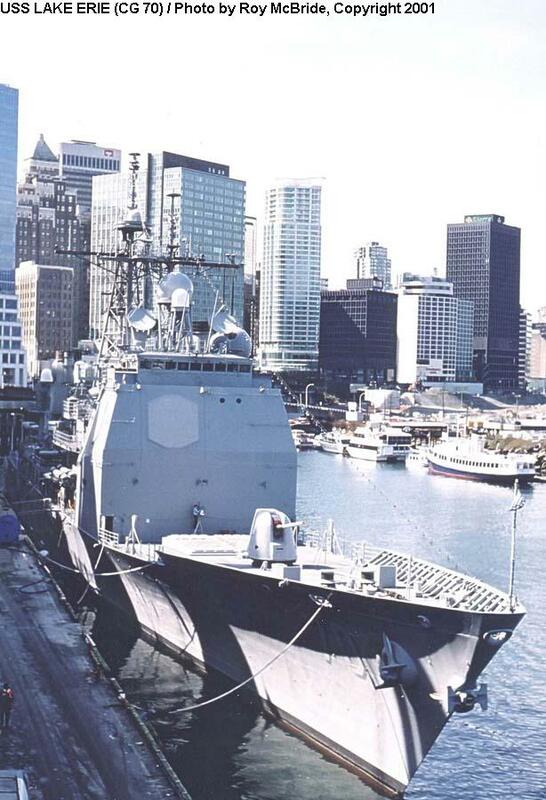 The ship has a single 5-inch/54-cal dual purpose gun forward, and a 61-cell Mk41 VLS between the gun and superstructure. Starboard-side view of the main superstructure, midships. The superstructure in these ships is large, bulky, and complex. 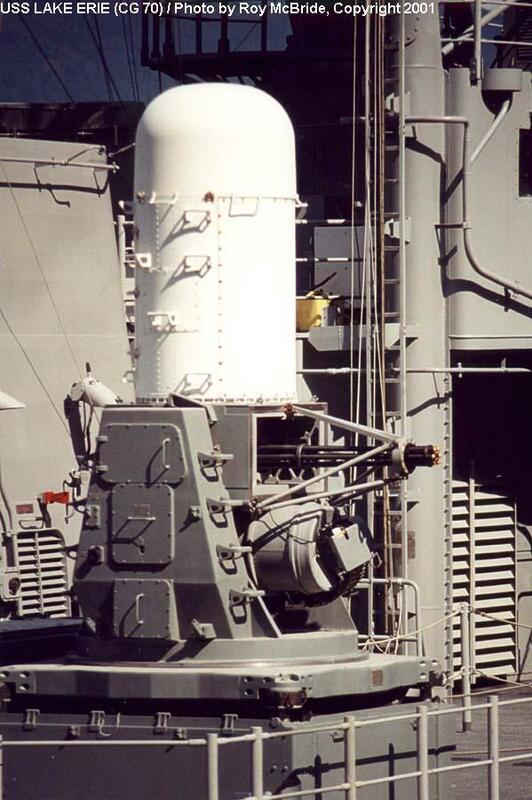 The starboard-side Phalanx CIWS is in the center of the view, with the starboard SLQ-32(V)3 electronic warfare antenna system below. 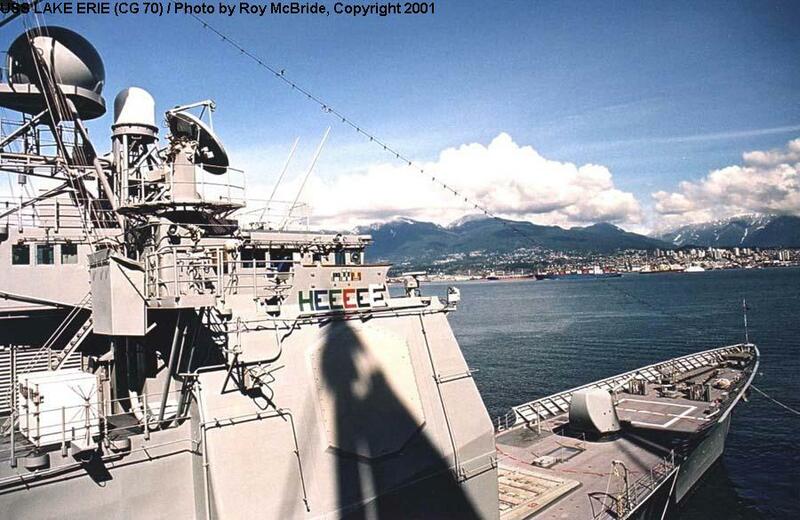 The port CIWS is mostly obscured behind structure and a communications antenna dome. View of the starboard bridge wing and pilothouse. 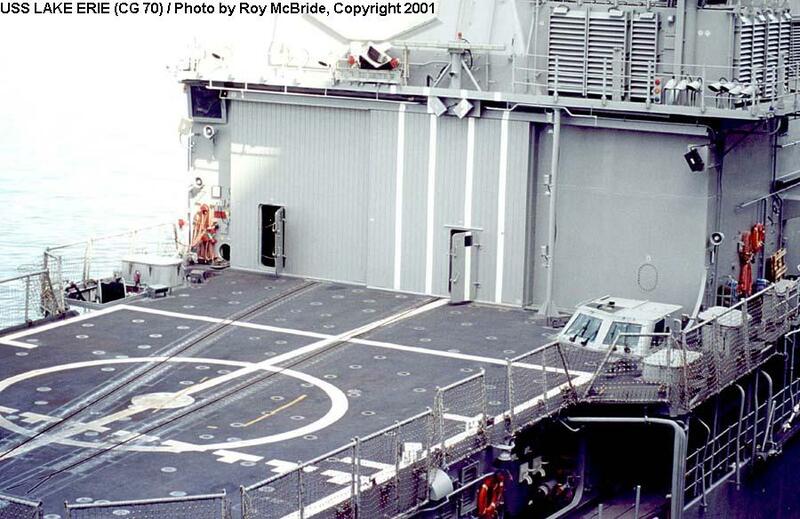 The dish-type antenna is one of four SPG-62 missile directors; the large gray dome at left is the SPQ-9 surface search radar for the gun fire control system. There is a small commercial navigation radar at the starboard forward corner of the superstructure. A view looking aft into the superstructure, starboard side. The forward two SPG-62 missile directors are at right; the two Phalanx CIWS at left. View from astern. 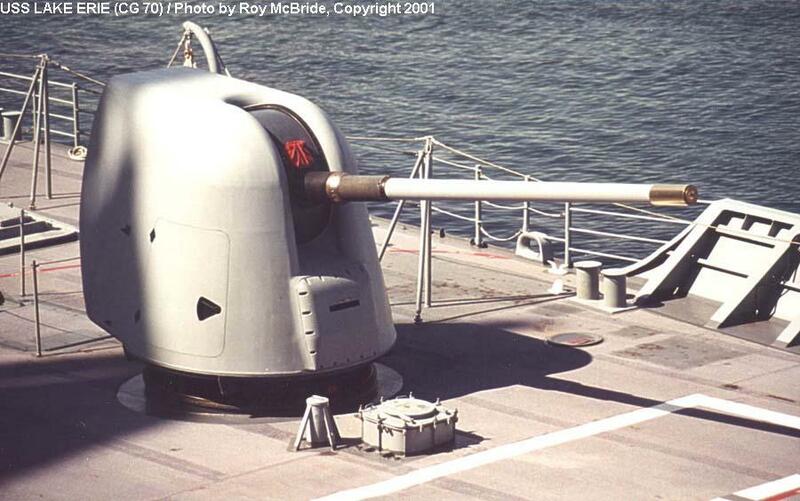 There is a second 5"/54cal gun aft, and a second 61-cell VLS between the gun and superstructure. The ship can carry up to 8 Harpoon missile cannisters at the port corner of the fantail, but only four are fitted here. The aft superstructure supports the other two SPY-1B arrays, one facing aft and one to port. 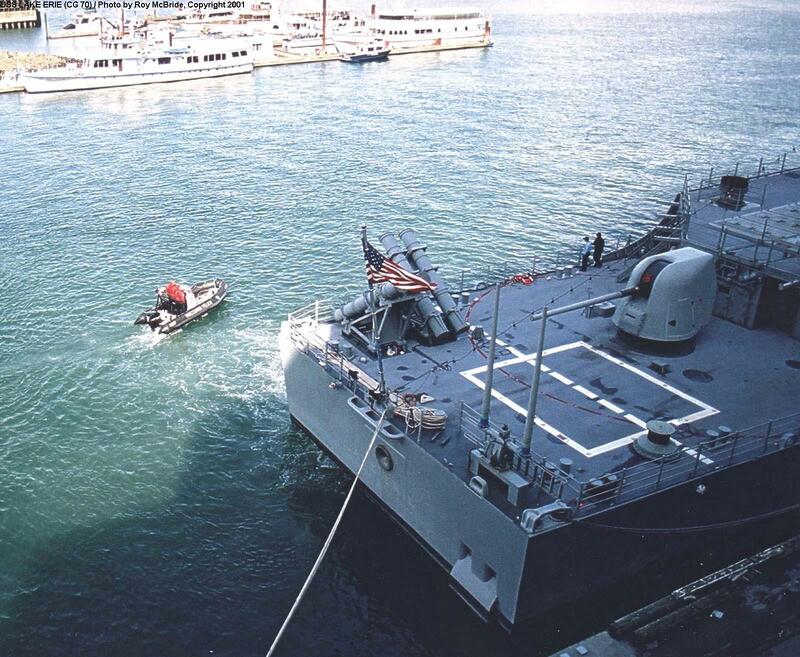 The round port in the transom is for the SQR-19 towed array sonar; the two square ports are for the SLQ-25 Nixie torpedo countermeasure. A view of the flight deck, looking forward and to starboard. 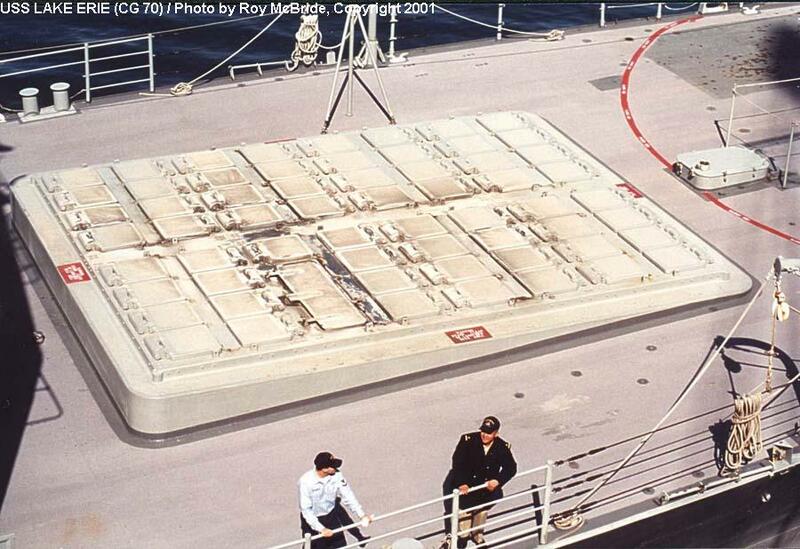 The two "tracks" in the deck are for the RAST system, which is used to land, secure, and move the helicopters on deck. 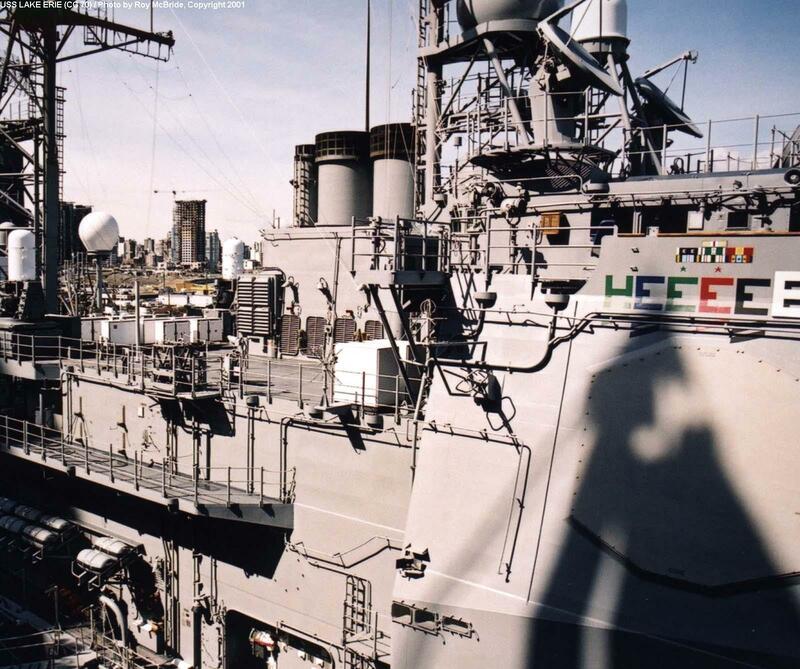 Looking across the stern, showing flight deck, aft VLS, aft 5"/54cal gun, and Harpoon missiles. 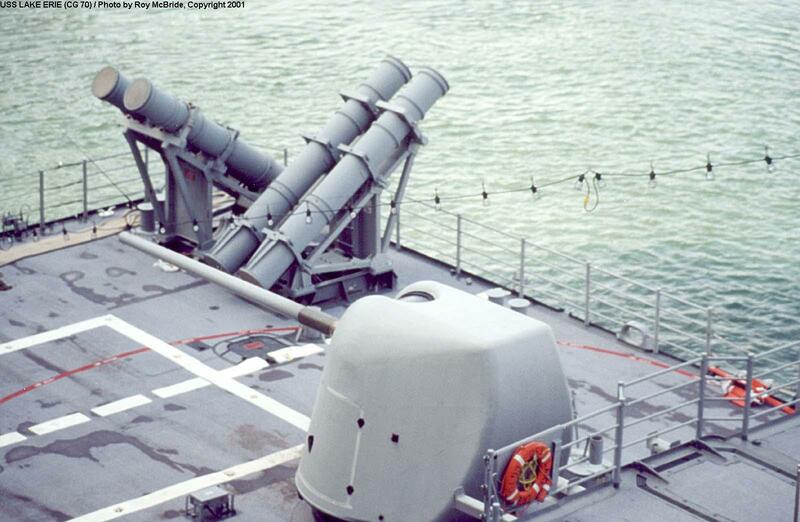 A close view of the aft 5"/54cal gun and the Harpoon missiles. View across the stern, showing the gun, missiles, and a police boat providing a security patrol. 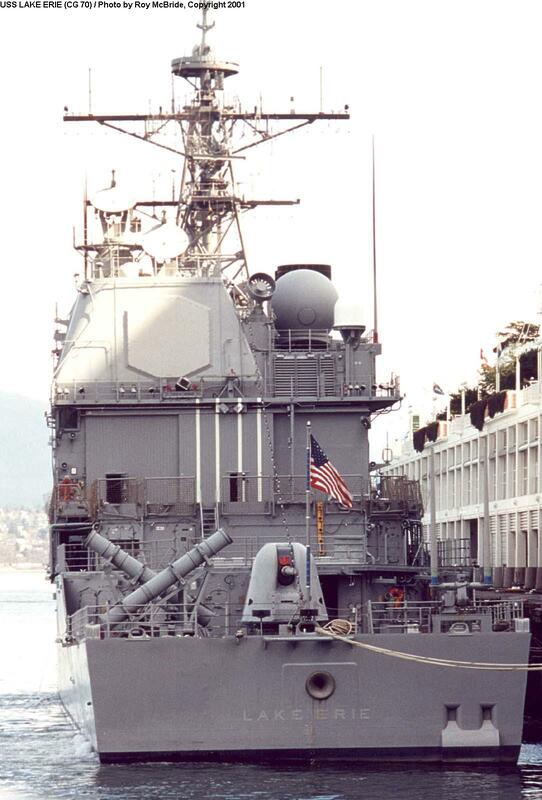 A close view of the aft VLS. 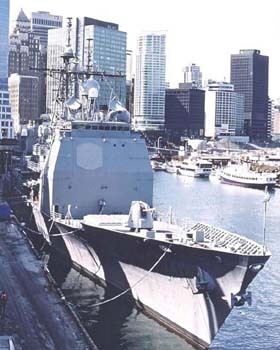 The 61-cell VLS can accommodate various SM-2 series anti-aircraft missiles, Tomahawk land attack missiles, and Vertical Launch ASROC antisubmarine weapon. 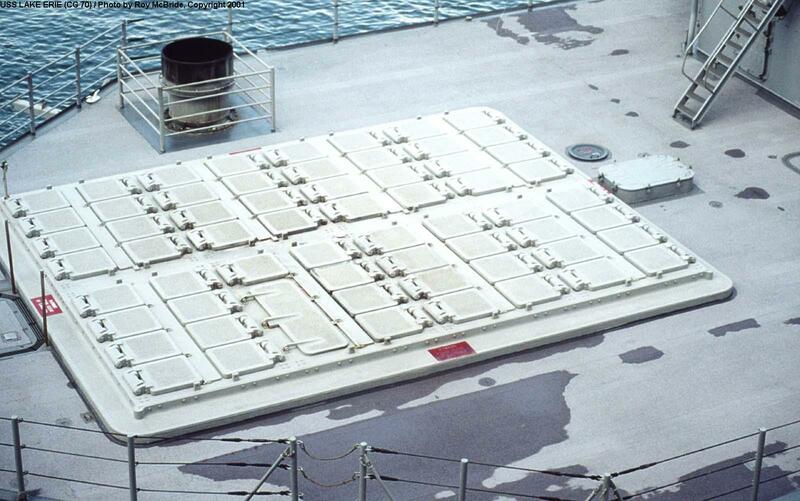 The forward 61-cell Mk41 VLS. Closeup of the forward 5"/54cal gun. The SPS-49 2-D air search radar. 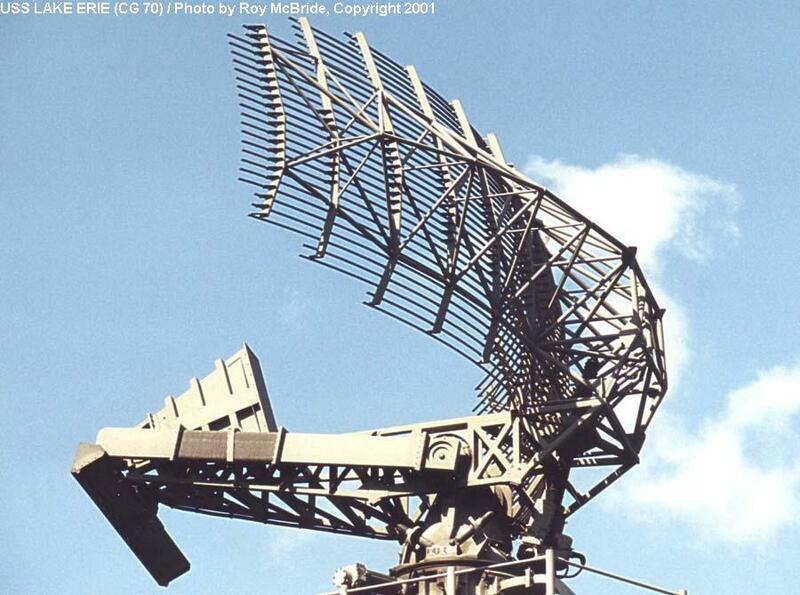 This radar is provided as a backup/alternate to the primary SPY-1B radar system. 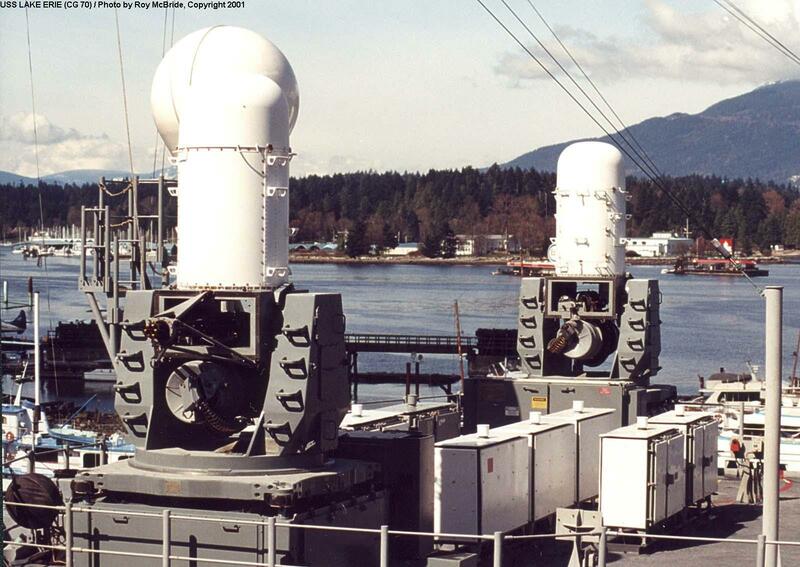 View of the port and starboard Phalanx CIWS mounts. 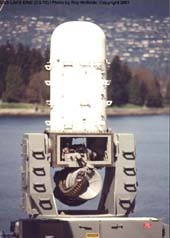 Phalanx CIWS closeup - rear. Phalanx CIWS closeup - front. Copyright © 2001, Andrew Toppan. All Rights Reserved. Photos Copyright © 2001, Roy McBride. All Rights Reserved.